Global resource systems seniors Deepak Premkumar and Dylan Clark are presenting their Tanzanian research at an international conference in Scotland. Larger photo by Bob Elbert. AMES, Iowa -- It's not the least bit unusual for Iowa State University researchers to present their work at academic conferences around the world. In fact, it's an everyday occurrence. It is unique, however, when the research presenters at an international scientific forum are undergraduate students. Dylan Clark and Deepak Premkumar will be the only undergraduates presenting at the European Space Agency's (ESA) Living Planet Symposium in Edinburgh, Sept. 9-13. An estimated 1,700 participants will hear the latest research on Earth’s environment and climate derived from satellite data. The students conducted the research for their presentation, "Geospatial Analysis of Natural Resource Access Influences on Agricultural Practices and Livelihood Wellbeing," in Tanzania the summer following their sophomore year at Iowa State. 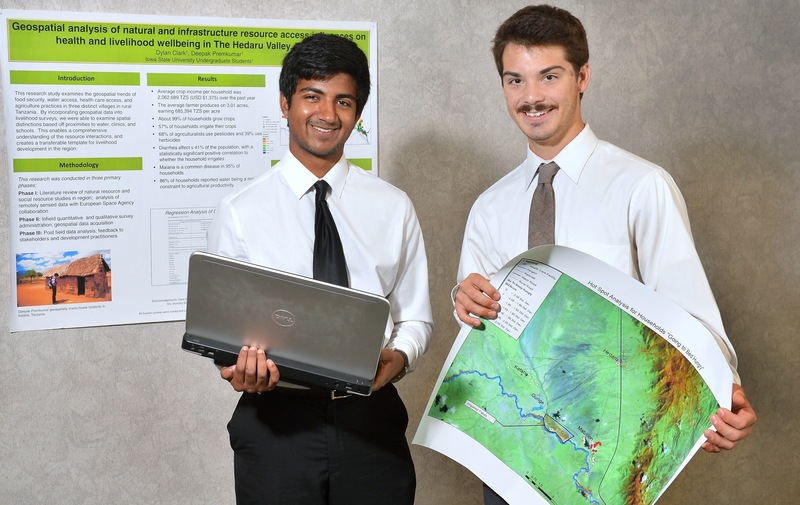 Clark and Premkumar, both seniors in global resource systems from Ames, used ESA satellite images to help create a needs assessment tool for prioritizing development interventions. The students combined GPS and geospatial views with information they gathered in focus group discussions and household surveys in three rural villages in northeastern Tanzania. They produced a comprehensive framework that can be adapted to conduct needs assessments throughout the developing world, providing nongovernmental organizations (NGO) and governmental agencies with essential knowledge. The project grew out of a presentation at Iowa State by the NGO Empower Tanzania Inc. (ETI) when Clark and Premkumar were sophomores. "ETI wanted to develop these villages in rural Tanzania, but didn't have enough information to make sound judgments about which developmental interventions to take," Premkumar said. "So Dylan and I offered to do the research on the ground and create a needs assessment to figure this out for them." Clark and Premkumar — former classmates at Ames High — complemented each other's skills. Premkumar brought a math, economics and statistics background to the research, while Clark concentrated on the environment, agriculture and geography. Together they conducted a literature review, designed the research experiment, planned the surveys, led the fieldwork and completed the analysis. And they successfully applied for a research data grant from ESA, which offers high-resolution satellite images. The two spent eight weeks in Tanzania. Although Clark had previous experience in Uganda and Premkumar in India, living alone and conducting field research were new adventures for both. Premkumar with Tanzanian village leader. The villages in the study are in the Hedaru Valley, the lowlands of Tanzania's Pangani River Basin. Environmental changes and population growth through migration has strained the area's natural resources. Although developmental agencies work in the region, they lack hard data and cross-disciplinary information to guide programs. The two lived in a town near the tribal villages. With the help of village leaders and government extension officers, Clark and Premkumar conducted quantitative, randomized surveys of 80 households and led 14 focus group discussions. Premkumar said the focus groups could get "incredibly lively" despite the need for double translation. The remote villagers spoke tribal languages that required translation into Swahili and then English and vice versa. "We realized how resourceful they are at adapting to drought and climate change. They've figured out certain methods to survive where there's a dearth of resources. It was really quite impressive," Premkumar said. After collecting information from the villagers, Clark and Premkumar created a map that combined their qualitative findings with data from Geographic Information Systems (GIS) and overlays of ESA's geospatial imagery. For example, answers to survey questions like "Has anyone in your household gone to bed hungry in the past four months?" were mapped according to the household location, along with the sites of critical resources, such as schools, clinics, wells and churches. By integrating various research tools, they were able to present a comprehensive view of regional livelihood constraints and broader trends between natural resources and social indicators. The result is a holistic, cross-disciplinary assessment tool that uses a new mapping paradigm to pinpoint developmental limitations, needs and relationships. "This is the gem of the project," Clark said. "You can focus on an area of the map and point to where irrigation is and see how that has an impact on their food security." After presenting their work to Empower Tanzania Inc., they visited Dar es Salaam to speak with the African Development Bank, the World Bank, the French Development Agency and United Kingdom's Department for International Development — agencies that have "some relationship with the area so our information can be useful" to them, Clark said. Since their return, they have presented the research at the Heartland Global Health Consortium Poster Competition and the Norman Borlaug Poster Competition, winning first place and second place respectively. Last winter, they submitted their abstract to ESA's Living Planet Symposium "on a whim," then forgot about it. On the last day of spring semester in May, they received the acceptance email. "Obviously, as undergraduates we don't have the full capacity to spread the work or to continue the research yet," Clark said. "So we hope we can get others at the conference thinking in these interdisciplinary ways to combine human and geospatial aspects." And they can learn how others apply geospatial technology to development and climate change issues, Premkumar added. Both plan to attend graduate school. Clark is interested in researching climate change adaptation. He has already started another project in Uganda that combines a wellness survey with a geospatial component. Premkumar plans to study economics and conduct development research or work in a think tank. "The Tanzania research is the accomplishment I'm most proud of," Premkumar said. "It has completely changed my opportunities and experiences." Global resource systems seniors Dylan Clark and Deepak Premkumar will be the only undergraduates presenting at the European Space Agency's (ESA) Living Planet Symposium in Edinburgh, Sept. 9-13.They conducted their research in Tanzania the summer following their sophomore year. The students combined GPS and geospatial views with information they gathered in focus groups and household surveys in three rural villages in northeastern Tanzania. They produced a comprehensive framework that can be adapted to conduct needs assessments throughout the developing world. Clark and translator at Tanzanian focus group. "So we hope we can get others at the conference thinking in these interdisciplinary ways to combine human and geospatial aspects."